What with today being 20th December, or 20/12 and a convenient marketing date for the Games, there's quite a bit of Olympic-related news about. First up is the announcement of an arboreal art installation in the Olympic park. 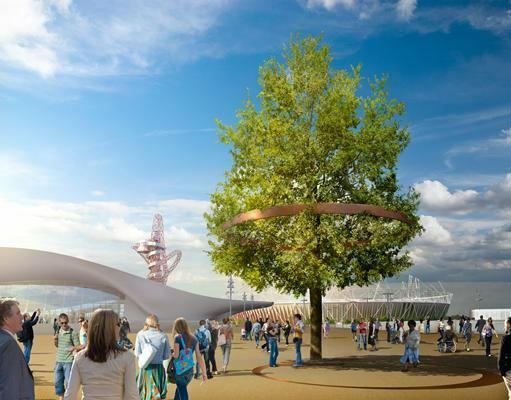 Ten of the tallest trees will each have a 20ft wide metal band wrapped around it; over time the tree will envelop the band and act as a "permanent reminder" of the Games. We're promised that the inside of the rings, designed by British artists Ackroyd and Harvey, will also be inscribed with "hidden histories", including data gleaned from archaeological surveys. We suspect they'll also be tempting targets for graffiti writers. In other Olympic news, the Legacy Committee is being bullish about the future of the Stadium, ahead of the bidding process for a long term tenant, which begins today. The OPLC's chief executive Andrew Altman said that they were "keen" to do a deal with West Ham United and Newham, the joint bid which had previously won the aborted competition to take over the stadium, but stated that its future viability was "not solely dependent" on a football club's involvement. With London having secured the 2017 World Athletics Championship, Mr. Altman is perhaps right in his belief that the stadium won't immediately be labelled a white elephant once the Olympic bunting has been torn down, but maintaining a successful legacy might be harder if it were restricted to infrequent gigs and sporting events. The stadium's post-2012 name is also uncertain. The expected £20m cost of transforming it after the Games is likely to be at least partly met by a corporate sponsor, which will also get the opportunity to brand it as they see fit. Naming rights for the other permanent structures, including the Aquatics Centre and Velodrome, are also set to be negotiated. One company unlikely to be involved in the bidding is Dow Chemical: the firm, which is sponsoring the wrap around the Olympic stadium, has agreed that its name and logo will not be displayed, after India reportedly threatened to boycott the Games due to the involvement of Union Carbide, now owned by Dow, in the Bhopal disaster of 1984.